Ask any kid what their favorite holiday celebrations are and you can bet high on the list is Halloween. What other time of year do you get a big bag of candy to hoard all to yourself? Even Christmas doesn’t come close when it comes to a candy fest! If you are planning a Halloween celebration, likelihood is you are considering the expense given that we’re just a couple of months away from the festive season. Costumes, decorations, food, it all adds up. Here are a few tips for a thriftier Halloween. · Costumes – Costume swaps are THE way to save money and recycle your old costumes. Costume swaps have been popping up in most towns and cities this year organised by community centres and parenting groups. It’s as simple as arriving at the event with your old costumes and going home with something new! · Shop Early or Shop Late – If you really want to grab a bargain, hit the stores late on the 31st October or early on 1st November before the goodies go back into the store’s storage units. You can expect up to 75% off at these times. · Homemade – If you have the time and skill, make your own costumes and decorations. Last year I sent my youngest to daycare as a Roman – I cut a hole in a pillow case and wove leather, gold string and fake ivy around his waist and legs. Ask your friends what they’ve done in other years and look for homemade inspiration online. · Candy – Buy in bulk and buy generic brands which are much cheaper than household name brands. A good tip is to hand out the candy yourself as little hands tend to take much bigger grabs of the goodies! · Decorations – Again, reuse and swap. 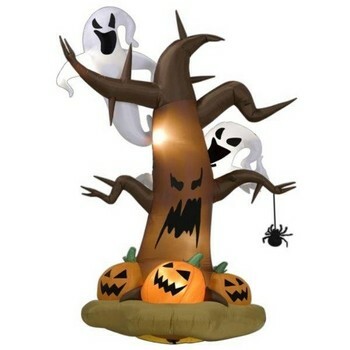 Let’s face it, Halloween decorations are usually made of plastic, a material you can reuse year in and year out. Buy decorations you like. · Thrift Stores – Thrift store usually have aisles and aisles of Halloween costumes and accessories, especially for kids who outgrow their costumes year in year out. Heading to the thrift store in early October should ensure some great bargain hunting. · Play Dead – If you really don’t want to pay for a new Halloween costume, dress up in your usual clothes and play dead! All you will need is white make up and some fake blood. Do you have a business suit? Dead business man! Sports gear? Dead tennis player! You get the picture! Halloween doesn’t need to be an expensive occasion but if you are not careful the costs can add up. Setting a budget is another good way to prevent blowing the bank when it comes to décor, costumes and other ghoulish goodies! About the Author: Amanda Brooks is a ski instructor and writer who loves Halloween (and saving money!) Amanda teaches ski lessons and snowboard lessons all over Europe and North America.